Saint Thomas offers all sacraments in both English and Spanish. The Spanish Language Mass is celebrated at 2:30 PM each Sunday. There are many special events in our Hispanic Ministry. For more information on our Hispanic Ministries please call Marisa Owens, Hispanic Coordinator, at the parish office 205-663-3936. Saint Thomas Parish offers Faith Formation for 1st to 10th grade. For additional information, please contact the Faith Formation Office at 205-663-3936. 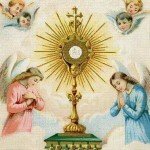 Saint Thomas Catholic Church offers the opportunity for Eucharistic Adoration on the 1st and 3rd Fridays of each month. Adoration is held in the Chapel at the Student Center – located on the corner of Highland and Moody Streets in Montevallo. For additional information or to sign-up call RoseMarie Vetrano 205-620-0051 or cell 205-370-6618. Saint Thomas Catholic Church is blessed with an active mens group of the Knights of Columbus. Please call the parish office for additional information 205-663-3936. Saint Thomas Catholic Church is blessed with an active group of Seniors age 50 and above. Please call the parish office for additional information 205-663-3936. The Knights of Columbus provide a pancake breakfast on the First Sunday of each month from 8:30 AM – 11:00 AM. Summer schedule 9:00 -10:15. All are invited! Saint Thomas Parish offers Faith Formation for all ages including a Ladies Bible Study. Saint Thomas Catholic Church is blessed with an active ladies’ group of the Ladies Auxiliary of the Knights of Columbus. Please call the parish office for additional information 205-663-3936. 205-266-5447 or call the parish at 205-663-3936. St. Thomas Parish sponsors coffee and donuts between the 8:00 AM and 11:00 AM Masses on the weekends when Faith Formation is in session. All are invited!